Arthur P. Ciaramicoli is a licensed clinical psychologist. He is the author of The Stress Solution: Using Empathy and Cognitive Behavioral Therapy to Reduce Anxiety and Develop Resilience and The Power of Empathy: A Practical Guide to Creating Intimacy, Self-understanding and Lasting Love. He has been treating clients for more than 35 years. Arthur is a member of the American Psychological Association and the Massachusetts Psychological Association. Currently in private practice, he has been on the faculty of Harvard Medical School for several years and a lecturer for the American Cancer Society. "Empathy calms the emotional brain so that we can perceive situations and interactions accurately and thoughtfully. With empathy, we produce our own natural stress-reducing chemicals that create calm, focused energy, allowing us to do and be our best." The good news is that we can produce this effect with practice by expanding our abilities to communicate with empathy." "Empathy is our common language, giving voice to the heart's most profound yearnings, eloquently articulating the soul's most anguished questions. Through its thoughtful actions and interactions, empathy creates the invisible connections that hold us together, one human to another, neighborhood to village, community to country, nation to planet." Empathy is the key to loving relationships and the antidote to the loneliness, fear, and anxiety that afflict us. Dr. Arthur P. Ciaramicoli, Ph.D., clinical psychologist and author of The Power of Empathy, defines empathy as your ability to understand and respond to the unique experiences of another. Explore the clear differences between empathy, sympathy, and compassion. Recognize when you have pre-judgments, expectations or projections when conversing with a family member or loved one and learn how to listen and reframe your intentions to allow for real interaction. As author Ciaramicoli shows, this state of affairs can be changed — while maintaining high performance success. His simple and realistic, yet powerful and profound techniques show readers how to use empathy to perceive accurately, use CBT to correct distorted thinking, and trigger our own neurochemistry to produce calm, focused energy. He developed this unique, three-pronged approach over 35 years working with clients struggling with depression, anxiety, and addictions. Over and over again, he has helped sufferers overcome old hurts and combat performance anxiety, fears, and hypervigiliance. Ciaramicoli’s is a truly pioneering approach, and one that offers new promise to readers facing a variety of stress-based concerns. "“We work too much, sleep too little, love with half a heart, and wonder why we are unhappy and unhealthy,” says Dr. Arthur Ciaramicoli. Is this modern day’s inevitable life dilemma? The good news is it doesn’t have to be. Effectively employing empathy has a surprising number of benefits, including lowering everyday stress levels and encouraging deeper, more meaningful connection between people. In the realm of work, great leaders using empathy can better tease out the potential in others by listening and learning who they are and what they could do. In this episode, we talk about the debilitating effects of stress, how we can rid ourselves of old negative stories about ourselves, and how performance addiction can really derail us, among several other compelling topics." "We work too much, sleep too little, love with half a heart," says clinical psychologist Arthur Ciaramicoli, author of THE STRESS SOLUTION, which provides powerful techniques for using empathy and Cognitive Behavioral Therapy to deal with a wide variety of stress related concerns. Clinical psychologist Arthur Ciaramicoli, author of The Stress Solution and Edwin Rutsch, founder and director of the Center for Building a Culture of Empathy are developing an interactive course to address and resolve the growing stress, anxiety and fear in America. The role of empathy and how it changes brain chemistry and creates open-minded thinking versus how stress produces certain chemical changes that produces narrow, black and white thinking are central components featured throughout the book. If you are interested in being in the call please leave your email and name below. Thank you very much for agreeing to participate as reducing stress and increasing empathy is crucial to lessening the fear and prejudice in our current society. The key to understanding prejudice is to use empathy to uncover the root of the bias and the negative physical effects it causes. Empathy is the capacity to understand and respond to the unique experiences of another. It is not an emotion or a feeling but a capacity that is innately present. Empathy is part of our genetic endowment; it is essentially our ability to read others accurately, to see beyond the surface into the soul of another human being. What Is Empathic Cognitive Behavioral Therapy (ECBT)? "The new combination of CBT, the power of empathy and the addition of how to change brain chemistry naturally is an integrative therapeutic method I have developed over the last 35 years. This unique psychology perspective will provide you with the most comprehensive approach to balance your mental and physical health while reducing stress significantly. CBT corrects distorted thinking and empathy calms the emotional brain so we can use this capacity to perceive others and ourselves accurately and thoughtfully. How we perceive is directly related to how much stress we accumulate. In addition this approach teaches you how to produce your own natural brain chemicals that create calm, focused energy to do and be the best you can be. These three components produce a synergy that enhances our lives and releases our potential. Studies indicate that Americans have fewer friends; trust has decreased as well as the degree of empathy shown to others, while prejudice has increased and race relations have deteriorated. Half of Americans lie awake at night due to job stress and three quarters indicate they suffer from emotional or physical stress symptoms daily." Arthur Ciaramicoli shared valuable tips on how to improve your empathy so you can create the most intimate relationships - in love, life, and work. 'How do you build the most intimate relationships? The key ingredient is empathy. 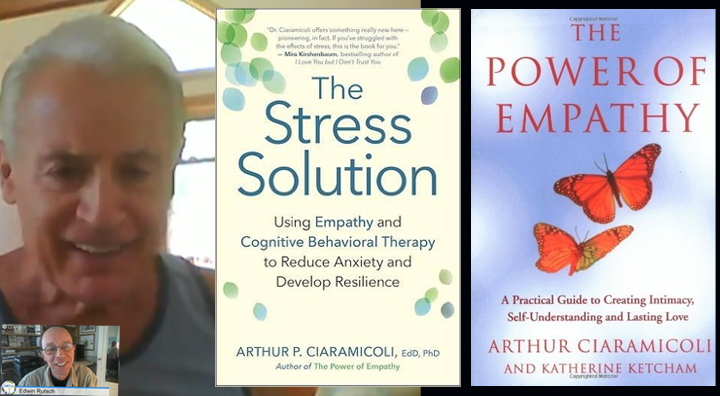 My radio guest, Arthur P. Ciaramicoli, EdD, PhD, is the author of The Stress Solution: Using Empathy and Cognitive Behavioral Therapy to Reduce Anxiety and Develop Resilience. Benefit of Empathy: We can accurately know others versus making incorrect assumptions. Empathy is different from sympathy. Empathy takes its time to understand. Empathy creates Oxytocin which counteracts cortisol and stress which then allows us to perceive in an expanded way. How to Find Happiness through Empathy! Listen to the podcast below! Arthur P. Ciaramicoli, EdD, PhD, is the author of The Stress Solution: Using Empathy and Cognitive Behavioral Therapy to Reduce Anxiety and Develop Resilience. He is a licensed clinical psychologist and the chief medical officer of soundmindz.org, a popular mental health platform. He has been on the faculty of Harvard Medical School and chief psychologist of Metrowest Medical Center. Join us to learn how to improve your relationships by reducing your anxiety, using empathy and cognitive behavorial therapy techniques. Youth Commission Chair Margie Wiggin introduces keynote speaker Dr. Arthur Ciaramicoli on MLK Day 2016 in Hopkinton, Massachusetts. Dr. Ciaramicoli, Hopkinton resident, is a clinical psychologist, the Chief Medical Officer for SoundMindz.org, and an author of many books. His humorous stories and parables will delight the viewer.